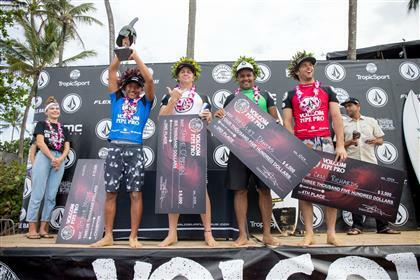 Josh Moniz, 21, claimed the Volcom Pipe Pro today in exceptional, all-time conditions at Pipeline after overcoming a stacked Final heat that included a perfect 10-point ride from former event winner and Pipe prodigy Jamie O’Brien (HAW). This marks the ninth event of the Volcom Pipe Pro history, a World Surf League (WSL) Qualifying Series (QS) 3,000 event, and Moniz takes the fifth win to join the elite list of warrior winners that also includes 2x World Champion John John Florence (HAW), 11x World Champion Kelly Slater (USA) and Australian Soli Bailey. A surf dynasty in the making, Moniz comes from a family of titleholders including father Tony Moniz, who has dominated Pipeline in the past, and sister Kelia Moniz, a 2x World Longboard Champion. 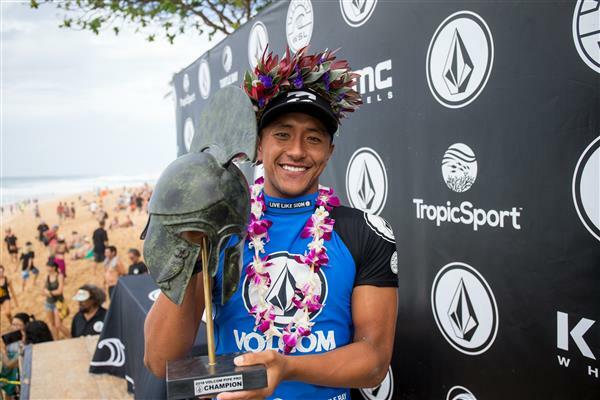 Josh has been campaigning on the International QS for over five years and today’s victory marks his first – and best – win of his career since 2015, when he had back to back wins at the Pipe Pro Junior and Martinique Surf Pro. An event for the underdogs, the final day of the Volcom Pipe Pro took place on Super Bowl Sunday and rivaled the entertainment with perfect, barreling surf. Wave faces exceeded 15ft. and athletes feasted on conditions that many are calling the best of the 2017/’18 winter season. In the Final, Moniz went against O’Brien, who ultimately claimed runner-up, Weslley Dantas (BRA), who took third, and Cam Richards (USA), who earned fourth, all who put in phenomenal performances throughout the entire five days of competition. The last heat of the day garnered a mass of fans who eagerly cheered on their favorite surfer, and with Dantas and Richards shaking up the home-field advantage, it was an event for the history books. O’Brien dropped the first wave of consequence in the 30-minute Final, a 7.43 for tactical surfing and a perfect backhand approach for a Pipeline barrel. After a couple missed opportunities by Moniz, he redeemed himself with a late takeoff and extremely deep barrel, disappearing behind the curtain and pumping on his backhand to pull himself up and into the pit for an 8.83 from judges. Dantas, a powerhouse surfer and brother of former Championship Tour (CT) athlete Wiggoly Dantas (BRA), found a beautiful left that earned him a solid 5.93. Meanwhile Richards rolled into a couple of big, foamy and seemingly unmakeable barrels, the type of surfing that made him a true standout of the event. But neither were able to catch up to the precedence set by Moniz and O’Brien and the second half of the heat was a battle between the two locals. Cheers from onsite fans matched those in the Minneapolis stadium as O’Brien dropped a perfect 10-point ride in the Final for a massive late drop into a beautiful wave. With expert technique, he steered through the foam ball then hit the brakes for another barreling section and steadied himself on the board while dodging through the exit, both hands raised in utter triumph. But with Pipeline churning out perfect waves all day long, it was only a matter of time and positioning before Moniz surpassed O’Brien for the win. All competitors threw themselves over the ledge during the 2018 Volcom Pipe Pro, which historically sees some of the best surf all season. Another standout performer was Carlos Munoz (CRI) who added another perfect 10 to the event in his Round 5 heat today against Marco Giorgi (URY), Ezekiel Lau (HAW) and Takayuki Wakita (JPN). Munoz wowed judges and fans after threading through a long Backdoor wave and negotiating the treacherous foam ball, eventually blasting out of the barrel with a clean exit. Each year, Volcom honors legendary waterman Todd Chesser – who passed away much too early in 1997 while surfing an outer reef break on Oahu – with an award presented by Todd’s mother, Jeannie Chesser. This year, Australian phenom Jack Robinson took home the prestigious honor and was called up to the awards stage to receive the handmade trophy from Jeannie. 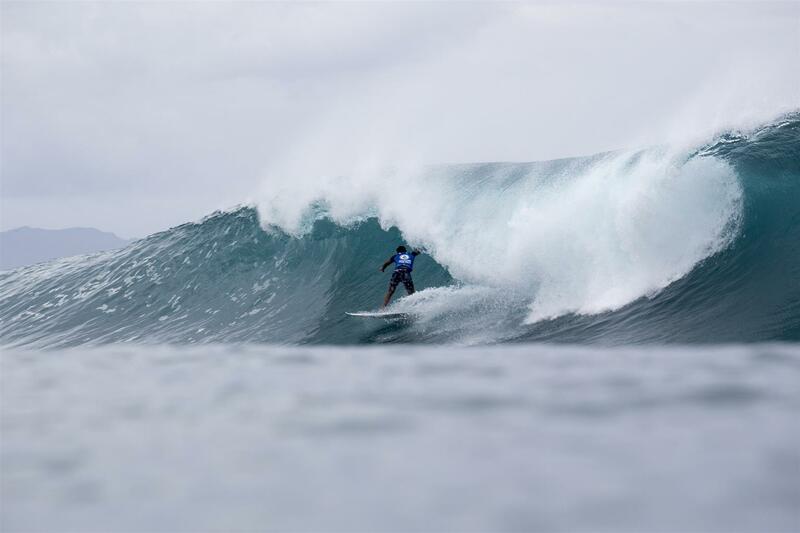 The WSL Hawaii/Tahiti Nui region will shift to the warm waters of Tahiti for the Rangiroa Pro Open, a Men’s QS1,000 from March 5 – 9, and the Papara Pro Open, a Men’s and Women’s QS1,000 and Men’s and Women’s Pro Junior from March 11 - 16, before returning again to Pipeline for the Pipe Pro Junior and Wahine Pipe Pro. Catch the replay of the 2018 Volcom Pipe Pro on Spectrum SURF Channels 250 and 1250 HD across the state of Hawaii! 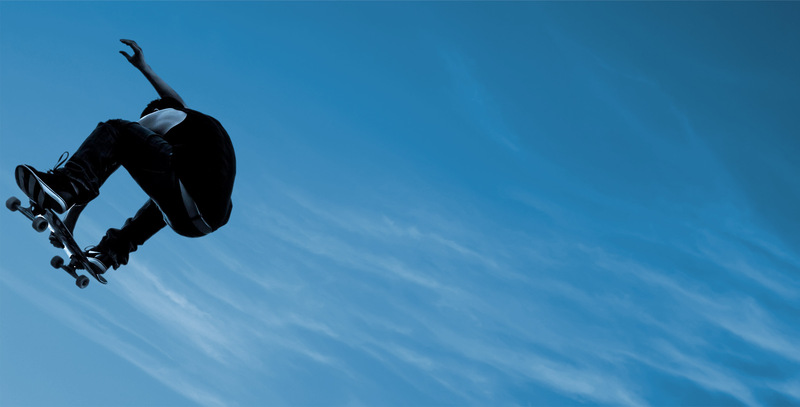 Make sure you don't miss any action: follow WSL online or on their Facebook page.